Blogging in front of a roaring fire again. First time all day I’ve been warm. I just found out that if you live in Illinois, you can ask for a free Radon test. I ordered mine today. If you have a finished basement, you should definitely request one. Got the winter blahs? Got some big cardboard boxes and some kids? Check out Mr. McGroovy! You’ll note our pirate ship is much cooler than the one he’s got, but we’re pretty hip that way. And we didn’t buy any plans or rivets. Nothing but duct tape and boxes for us! 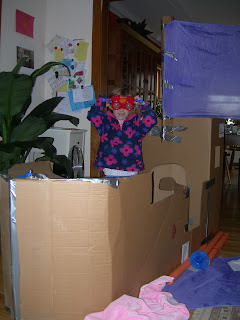 Well, and a Cranium playfort sail. Boo is sporting a pair of Cranium Giggle Goggles , which I highly recommend, especially if you happen to have a sunglass-obsessed child, as I do. It's the other kid, but let's not quibble and argue about who pushed down whom for the goggles.